HOW TO MAKE A CIGAR FROM SCRATCH! | .WE.ARE.GNOMADS. HOW TO MAKE A CIGAR FROM SCRATCH! Although the big cigar trend of the 1990’s is over, maybe Obama and the Governator have brought back a bit of lust for the big ole stogie. Even though Obama is trying to make tougher laws for ciggie factories in the States, the cigar makers in Nicaragua are happy to see he has not yet quit smoking. 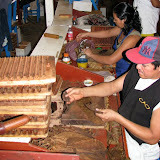 Cigar making is not a simple process and it is done mostly by hand. First, you have to have some of the best soil in the world for tobacco. You see, after Castro took over in Cuba, many of the cigar makers wanted out of Cuba. So they took tobacco growths and seeds from their fields and went in search of the best place to grow them anew. They found the mountainous area around Esteli, Nicaragua. And we found Nicarao Cigars. When you have the right place, you then grow the plants, pick the leaves at the right time and dry them out properly. Drying is a science. 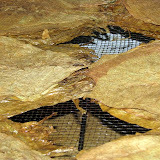 For every kind of tobacco there is a different drying method. Some have 2 feet square piles of leaves that are bunched together by their stems in small groups. These large piles of tobacco emit an ammonia stench and the workers cover their noses and mouths. The staff shake out the individual groups and move them from one pile to another for the full drying process. There are thermometers stuck into each pile to make sure the temperature is at the perfect level. Seeing that cigar tobacco is grown in eleven different countries, there are different ways to dry the different tobacco. Another way is to lay the tobacco leaf out in small piles on screens in a room with a de-humidifier. In all honesty, the tobacco they use is not just from Nicaragua. I think they have some cigars that are just Nicaraguan tobacco, but otherwise they use tobacco from all over the world, even Connecticut. I would have figured tobacco from South Carolina, but no, CT has the shade grown tobacco good for cigars. Who knew? After the drying process, there is the separating, de-veining and breaking of the leaves. If a leaf is still whole, the staff will tear the vein out, splitting the leaf in half, and then she will separate them into quality piles (for color, texture and what kind of shape it is in). Other women tear up the leaves that are not in good enough shape to be rolled. This tobacco goes into a cheaper type of cigar. The broken tobacco goes into a shaker to get the tiny bits and pieces out and they use that for fertilizer. Even the veins get reused as bundle ties. Now, we are ready for the rolling. Again with the science, it can not be too tight or too lose and there is a supervisor that checks every single one! Most of the rollers do it by hand, but there are a couple that have a rolling machine. It reminds me of a little contraption my older brothers had in the 70’s for rolling joints. After the cigar is rolled, it goes into the cigar shaped mold. When the mold of 10 cigars is filled, they put it in a press. Everyone box has to be pressed for 10 minutes on both sides. By the way, the tobacco ladies are paid by the pound of tobacco they process in one day. The rollers are paid by the amount of cigars they roll. All ending in very low wages, but they do not seem unhappy with the job they have. Most people in the little country towns do not need a lot to live on, so why complain? After the cigars pass the rolling process, they are bound up in newspaper to await the boxing process. The first step in the boxing process is the making of the boxes…each type of cigar has a different box and each country they ship to gets their own box as well. Before they go into a box, there are several steps. 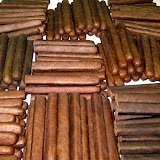 You have the guy who separates them by color; each box of cigars has to have the same coloring. It is not a quality thing; it is just an esthetics thing. After they are grouped into coloring groups they are passed on to the labelers. These women put those little ring labels on ever single cigar, slips each into a clear plastic sleeve and then puts them into the boxes. The boxes are then passed on to the people who seal the boxes closed and they also cellophane wrap them for freshness. And there you have it! Now go roll your own! Oh wait…after the cigar tour is finished, the buying begins. On the way to the gift shop, well, um, gift cabinet, we saw the pets of Nicarao Cigars, an ocelot, 3 monkeys (with the softest hands), a Toucan and a couple of Scarlet Macaws. Who knew cigars and wild beasts go together? Anyway, with the excitement of cigars all around him, Jim bought 10 cigars, 3 different kinds, and a box (yes the box was extra). The cigars were cheap; I bet they do not go for $1.00 each where ever they end up in the world. 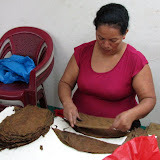 ~ by HenderBalz on July 5, 2009.
this is great information i never knew how to make a cigar.. i have been trying some brands from there and it is really interesting how they make them thanks for the great videos!